By far the biggest problem that I work with CrossFit athletes for is shoulder pain. 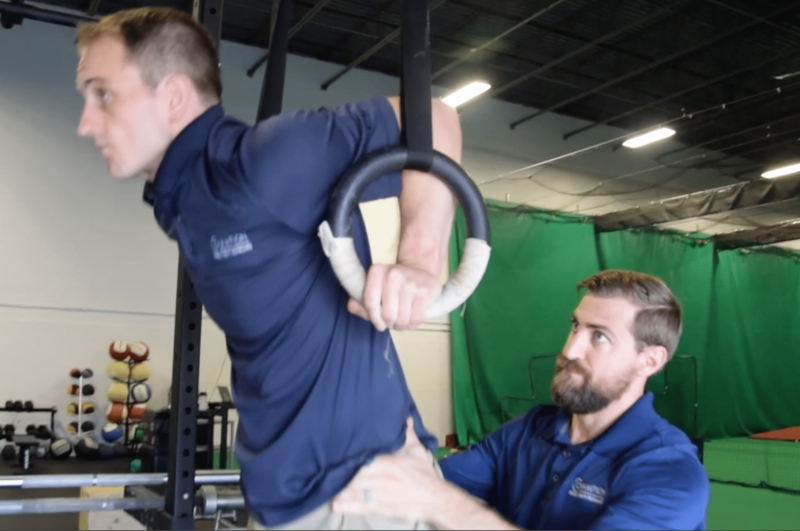 There are a variety of factors that go into what movement is causing the pain, but a common skills people say started their shoulder pain is muscle ups. Here are 3 of my go to tips for people who are struggling to over come or come back from a shoulder injury caused by muscle ups. There are 3 distinctly different positions of a muscle up that require lots of shoulder motion. The first is the starting hang position, which requires full overhead elevation of the shoulders. The second is the bottom of a ring dip, which requires full shoulder extension and elbow flexion to comfortably control. This one is very hard for many people to show, even in an unloaded position. The last is a full ring support, which needs neutral shoulder motion, but full elbow extension and shoulder external rotation for proper ring turnout. You can see these positions demonstrated by Dave Durante in screenshots I took from our upcoming educational product “Monkey Method: Movement Essentials” set to release May 16th (more below). These motions should be screened for and restored if not present. Notice that I said active shoulder mobility above. I think it’s very important athletes can achieve these positions on their own first, rather than depend on gravity during hanging or the dip to do it for them. Having full rage mobility sets the stage for good control and progression, which is key to reducing overuse injuries. Here is a short clip with some of my favorite shoulder mobility drills. Team Power Monkey Captain Dave Durante and I both strongly agree that lots of shoulder issues in muscle ups stem from people not being mobile enough, strong enough, and comfortable enough in the bottom of the dip. Athletes must be sure that they can fully engage at the bottom of the dip in their extreme range of motion. This also includes having a good chin tucked position, tall chest, slightly turned out ring position, and not allowing the shoulder to rock forward in the joint. This reduces the amount of overload that goes on some important shoulder structures like the labrum, anterior capsuloligamentous complex, rotator cuff, and long head of the biceps. If you want to not risk extra shoulder stress, focus on a solid bottom of a dip and spend a lot of time doing drills to get stronger in this position. Paused bottom dip holds are great for this. Here is one of my personal favorites that I give out to a lot of people. The product is over 150 pages, has 150 step by step videos, and 5 hours of educational content all teaching how to screen and fix common movement issues for these skills. For now, I hope this is helpful!